Dieser Link führt zu einem Präsentationsvideo zur christlichen Erbauung, die zeigt, wie der Adler die Schlange erbeutet, in die Luft hebt und dort tötet und verspeist. Auch dies wird als Übertragung auf das Holy Battlefield- also das heilige Schlachtfeld christlichen Gebets genommen. Das ROSENKRANZ-GEBET - wird als autoritatives Beispiel aufgeführt, wie solche siegreichen geistlichen Kämpfe zur Ehre Gottes gewonnen werden. Der einfache und humane Weg, Afrikenern IHR Afrika schmackhaft zu machen, so daß sie nicht auf der Suche nach "Grünen Wiesen"-acc. Pslam 23 nach Europa invadieren. Extreme Armut ist nur eines der vielen Ursache-Wirkung-geflechte, neben hoher Vermehrungssrate der afrikanischen Bevölkerung, die den Cultural clash- den Zusammenstoß der Kulturen verursachen. Es gibt Modelle, die sich an Szenarien orientieren aus dem Tierreich und auf die Anthropologie übertragen werden. Z.B. der Exodus der Meerschweinchen- genannt Guinea Pigs, oder auch das Lemminge-Prinzip. Jedesmal ertrinken oder stürzen zu Tode ein Großteil der aus einem begrenzten Environment ausströmenden Individuen- jeweils als Mass-Migration bezeichnet. In Offenbarung 12 und 13 ist nun zu lesen, wie genau und wo genau und mit welchen Akteuren das abläuft. Diese Kontextualisierung nach Exegese und Anwendung in einer ethisch und moralisch einwandfreien Hermeneutik ist das Ziel dieser Beiträge. Danke dem nigerianischen Archbishop für die zur Verfügungstellung seines Vortrags vor der Un und der African Rebirth Church. Keynote address by: Professor Genesis Api Dawuda Ph.D; Th.D; D.D.(h.c. ); D.Met; D.Ed; KSA Presented on the 4th of October 2018 at the 3-day conference Powered by Centre for World Rebirth, chartered by UFCMI USA, Registered/accepted by UN-DESA. Held at Elohim Assembly, opposite Eminent Beacon High School, Apata Jos Plateau State, Nigeria. 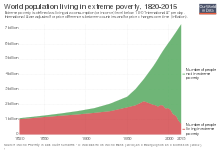 Extreme poverty: Abject poverty, absolute poverty, destitution, or penury, was originally defined by the United Nations in 1995 as "a condition characterized by severe deprivation of basic human needs, including food, safe drinking water, sanitation facilities, health, shelter, education and information. It depends not only on income but also on access to services." In analyzing Extreme Wealth, my mind quickly runs to Mumbai in India, a city of imbalance. With an estimated wealth of $950 Billion USD, the city is the 12th richest in the world, ranking ahead of major urban Centers likes Paris and Toronto. Much of this prosperity is due to the combination of a large billionaire population and the presence of India's oldest, and most prominent Stock exchange. At the same time, more than half of the city's population lives in slums. 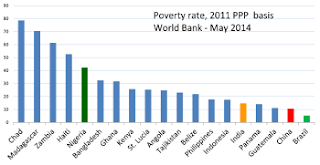 Or areas of extreme poverty that often lack access to clean water, electricity, and public transportation. With an estimated 6.5 million people residing in these conditions. Mumbai has the largest slum population of any city in the world. This disparity is not unique to India. As cities around the world become denser and more urbanized, the gaps between rich and poor have widened to intolerable extremes. But unlike in many cities, Mumbai's slums sit at the heart of economic activity in the urban core. This has resulted in a unique geography, wherein packed single-storey dwellings border the city's expensive high-rise buildings. Johnny Miller captured the troubling inequality of Mumbai as a photographer, in his photo series, Unequal Series, whose remarkable progress has given way to many side effects. The top 1% of India's population holds nearly three quarters of the nation's wealth. The Mithi River separates the Dharavi slum to the right and the Bandra Kurla to the left - the site of many wealthy financiers, real estate professionals, and media executives. The city is currently constructing a bridge to connect the two locations. Though one side is more impoverished than the other, both are home to wealthy institutions. On the right, the Bandra Kurla hosts India's top energy company, the Oil and Natural Gas Corporation. But the neighboring slum is home to the Bombay Stock Exchange and the Consulate generals of several countries. The stock exchange is surrounded by dilapidated, single-story homes- a metaphorical and physical reminder of the city's inequality. The Bomay Stock Exchange issued more than $2.2 trillion worth of shares as of March 2018. Understanding the context of a place is important. Joel 1:4 "What the chewing locust left, the swarming locust has eaten, what the swarming locust left, the crawling locust has eaten. And what the crawling locust left, the consuming locust has eaten." These four are described to be the 4 stages of the metamorphosis of the locust and at each stage, it causes damage. I describe it as 4 types of invasion by poverty as a plague. 1) Cutting or chewing of your prospects, connections, Progress, in life, ministry, business, and what have you. 2) Swarming: Your thoughts, and businesses been invaded by swarming disaster. They cloud and darken your thoughts. 3) Hopping or Crawling: They hop on your investments and destroy it. 20) Animals groans. (Romans 8:19-22) Creation groans for the manifestation of the sons of God. 1) The priest should gird themselves (with truth) 2) They should lament. Cry weakly and softly. 3) Wail before the altar( cry of sorrow and grief. Emit long loud cries) 4) Lie all night in sackcloth for offerings that are withheld from the house of the LORD 5) Fast 6) Call an assembly 7) Let the priests, who minister to the LORD weep between the porch and the altar; let them say, "spare your people; O LORD, And do not give your heritage to reproach. That the nations should rule over them. Why should they say among the peoples, where is there God?" 5) The LORD will speak to His people. 6) The LORD will send you grain and new wine 7) You will be satisfied 8) You will no longer be a reproach 9) The LORD will drive away your oppressors 10) You will never be put to shame 11) God will restore the years that the locusts have eaten 12) You shall eat in plenty and be satisfied 13) God will pour His Spirit upon you 14) You shall prophesy(announce, proclaim) 15) Your Old men shall dream dreams(mentoring) 16) Your young men shall see visions(strategic planning, etc) 17) God will raise you up 18) A closed mouth is a closed destiny. "Let the weak say I am strong." Joel 3:10 19) The harvest is ripe, put in the sickle. Joel 3:13 Opportunities abound everywhere. The signpost on the door of opportunity is called PUSH! Do you have a pastor? Who stands between the porches and the altars for you?